The demons are dancing for Bo Xilai. The former party chief is now far from his humid, smog-drenched municipality of Chongqing. Instead, Bo has spent the last week on trial at Jinan’s Intermediate People’s Court, facing an inevitable suspended death sentence over corruption and power abuse allegations. Separating Bo from his power base by putting him on trial in the provincial capital of eastern Shandong province has been just one of the various strategies employed by the Party in an attempt to take control of proceedings. Bo’s trial, in other words, is an event charged with emotion. The narrative is well known. In February 2012 Bo’s right-hand man and Chongqing’s police chief Wang Lijun appeared at Chengdu’s US Consulate, setting in motion a train of surreal revelations which implicated Bo’s family in the mysterious death of the British businessman Neil Heywood, revealed the amassing of an extended family fortune of $136 million, and a son busy leading a hedonistic, champagne-fuelled lifestyle in elite western universities. The economic interests of China’s political clans are eyewatering. And Bo, of course, was just the tip of the iceberg, emanating from the web of corruption that holds the CCP together. In August of last year, Bo’s wife Gu Kailai was given a suspended death sentence for the murder of Heywood. Gu’s appeal for leniency was a textbook show trial performance, right down to her praise for the prosecutors, who, in her words, “opened the curtains a little bit, to reveal the hidden dirty secrets”. Most China watchers expected that, once the Party machine had swung into action, Bo’s trial would be similarly predictable. “We would witness no courtroom drama” asserted Minxin Pei, writing for Bloomberg, “Bo will almost certainly be presented as a broken and penitent man”. 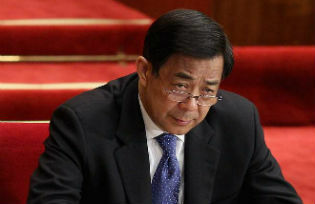 The Party’s control of the situation, through the usual surfeit of political machinations and disinformation, stretched from a spate of online posts declaring the CCP’s “determination to fight corruption”, the swift arrest of the journalist Song Yangbiao who had called on Bo’s supporters to gatecrash the trial, to the physical scrubbing of all references to Bo Xilai in Dalian’s Modern Museum, where he had served as mayor during the 1990s. The logic was that if Bo fought his charges, he knew that he would get a harsher sentence, instead of allowing President Xi Jinping to keep the washing of dirty linen to a minimum. The prosecution would be given clear instructions to strike a deal. And leaks to the press were consistent with this dampening strategy. But critical responses to Bo’s trial have been, frankly, astonishing. Rebecca Liao, writing in The Atlantic, has praised the trial for opening up a new era of jurisprudence. Despite the predetermined nature of the trial, Liao gushed: “if the Chinese government now views the law as something to be navigated and not simply ignored, then it has already overcome a significant ideological obstacle.” Far from it. All the choreography we have seen so far is that of a Party fiercely retaining control of the conversation. But the truth is that there are issues at stake that stretch far beyond the courtroom. The uneasiness surrounding the trial of Bo Xilai has always been more than stripping back the veil of the power struggles that play out right at the top of the Party, but rests instead with the very spectre that continues to haunt China’s political life. What is at stake is the legacy of the Cultural Revolution. Over the last five years, Bo pursued a distinct set of socio-economic policies, the ‘Chongqing model’, in sharp divergence to a state policy of privileging investment and export over living standards. And in doing so, Bo pulled his city out of economic stagnation. Chongqing’s radical redirection of state resources suggested a third way that looked to direct public policy towards addressing investment in social programmes and easing rural-urban conflicts. Bo’s neo-Maoist rhetoric provoked a wave of leftwing nostalgia and openly challenged Party consensus. His ‘sing red’ campaigns of mass revolutionary sing-alongs threatened to create an independent power base. Of course the Chongqing model, as ever, still perpetuated inequalities. Urban private development and forced evictions sat in collusion with officialdom. Audrea Lim, writing for n+1, is damning: “the Chongqing I saw, a few months before Bo Xilai and his Experiment met their fall, already showed evidence of how the bureaucratic, top-down approach was blind to individual experience”. A spat that erupted in the London Review of Books last year in many ways encapsulates the critical ideological battle within China. “Chongqing may not have offered a perfect blueprint”, Wang Hui acknowledged in his essay The Rumour Machine, “and it’s hard to know whether Bo himself was corrupt, but its architects stressed the importance of equality and common prosperity”. Wang Hui, a figurehead for China’s New Left, presents the fall of Bo as cover for the Party to push forwards with a new neoliberal economic wave that promises to foregound development over any notion of social justice. Wang Hui’s argument draws on his now infamous Tiananmen thesis in which he sees the accelerating marketisation of 1992 as being dependent on the crackdown of 1989. In the letters page, the journalist Jonathan Fenby dismissed “Wang Hui’s predictable take – it’s all a neoliberal plot”. “What Wang dismissed as neoliberal reforms are just the changes China needs if it is to progress”, Fenby concluded. How Fenby squares this conventional economic analysis with manifest social unsustainability is far from clear. For China’s New Left, authoritarianism and neoliberalism form part of the same machine. But the Chinese revolutionary tradition is far from finished. Last year, I wrote of the collective cultural amnesia that has been so central to Party strategy. This is what the New Left strikes at. The former leader Deng Xiaoping’s 1981 ‘Resolution on History’ labelled the Cultural Revolution a “disaster for the country and the people”. And in 2011 the liberal Southern Weekend newspaper commemorated this – the implication being that this framing of the narrative draws significant support from China’s liberal reform faction, against the New Left. Again, in a news conference foreshadowing Bo’s toppling, the former Premier Wen Jiabao invoked the ‘historical tragedy’ of the Cultural Revolution as a threat to the reform era ‘status quo’. But its spectre continues to haunt modern China. The Cultural Revolution’s pop cultural nostalgia that Bo so skilfully drew on, despite an offical historiography of trauma, reveals a chasm. How genuine are these repositories of Cultural Revolution nostalgia? Should we take the more negative view, of a highly commodified, depoliticized nostalgia, that is perfectly aligned with a neoliberal regime in which no proper platform for genuine alternative thought is offered? And yet there is no doubt that the revolutionary legacy remains key to China’s nascent labour movement. For the sociologist Ching Kwan Lee, the ‘spectre of Mao’ continues to haunt China’s class struggles. In his seminal work The Age of Wild Ghosts, the anthropologist Erik Mueggler travelled through China’s Yunnan province during the 1990s where, even then, complex memories of the Cultural Revolution still drifted. I had always struggled with Mueggler’s beautiful, often elusive prose. And then I realised that here, in the trial of Bo Xilai, was the very spectre of the Cultural Revolution. The official narratives seek to paste over the ideological cleavages that persisted from the end of the Cultural Revolution. And it is this lack of resolution that means we shall see eruptions such as Bo Xilai rage across China’s political landscape again and again. En Liang Khong is currently pursuing an MPhil in Modern Chinese Studies, and is a former editorial assistant at openDemocracy. He holds a BA in Ancient and Modern History from Oxford. He has been published in the New Statesman, the Daily Telegraph, the New Inquiry and the Financial Times. He is the recipient of Oxford University’s 2012 C.V. Wedgwood award for History, and is the 2008 BBC Young Composer of the Year.